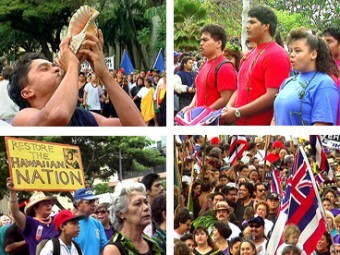 During four days in January 1993, thousands observed the centennial of the 1893 act of war against the Hawaiian Kingdom. ‘Iolani Palace, Ali‘iōlani Hale and the Queen's statue were the sites for the commemoration, which included a historic march, speeches, music and presentation of ho‘okupu (offerings). Featured also are musical performances by Kamehameha School students and the Royal Hawaiian Band.